Arne Jacobsen’s classic Egg Chair turns 50. Help us mark the 50th anniversary of this mid-century icon. Designed by Arne Jacobsen in 1958 for the lobby of the SAS Royal Hotel in Copenhagen, the Egg Chair is still used in advertising, film and television as a symbol of sophisticated urbanism. There will be several Egg chairs available for sitting, swiveling and lounging, and they will serve up Prosecco, deviled eggs and other golden hors d’oeuvres. You are all invited! Click on the image to read invitation clearly! Mobile Mondays New York is back! If you want to satisfy the geek inside you, join them tonight, March 24th at 6:75pm for another geeky talk. Recent advances in mobile video players, streaming technologies and transcoding platforms are enabling the transmission and reception of video universally across fixed and mobile devices. This evolution is creating new ways to monetize mobile video and develop new mobile audiences, a new advertising base and potentially new types of social networks. In parallel, mobile video broadcasting is being deployed with dedicated spectrum to relieve the bandwidth bottlenecks that will result when video streaming becomes widely popular over the mobile internet. How will these services complement each other? Mobile Monday will present speakers from five emerging companies active in mobile video and a panel discussion will follow. As always the event will end with free wine and beer and hopefully some party food! Back by popular demand! Discover your health “score”, test the latest technology in anti-aging, receive mini-galvanic facials, and find out your body fat and your blood pressure reading. In addition the first 5 attendees to sign up will receive gift certificates for a free 30 minute massage! So if you wish you could prevent disease, had a natural alternative to botox, test the effectiveness of your diet and diet supplements, this *free* event is for you! 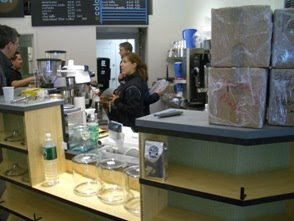 WHEN: Monday, March 24th, 2008; 5:00 pm to 8:00 p.m.
After lots of hard work getting our new shop in Chelsea (405 W. 23rd Street) up and running, we're finally just about ready. While we'll officially be opening the doors on Monday, we want to let you know that we're doing a "dress rehearsal" to which our regular customers (i.e., you) are invited: tomorrow, Sunday March 23rd, we'll be open from 4-6 p.m., serving FREE coffee drinks and snacks. We hope you'll have a chance to stop by, say hello, check out the new space (a couple of snapshots from earlier today are below), and grab a cup of joe on us. Celebrate the Vernal Equinox with live simulcast by superstar DJ Tracy Young! 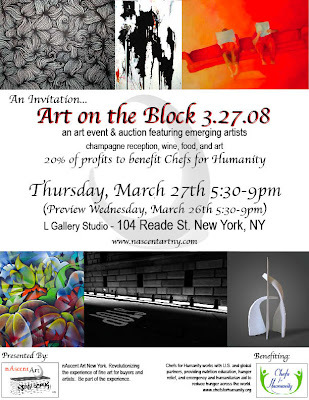 Opening Reception: Thursday, March 20, 6–8 p.m. The Onishi Gallery is pleased to present Ephemeral, an exhibition of paintings, sculptures, and photographs by seven Japanese artists. Ephemeral is the gallery’s contribution to this year’s Asian Contemporary Art Week, and it is the inaugural exhibition in the gallery’s newly remodeled space in Chelsea. Co-curating Ephemeral are Mako Wakasa and Nana Onishi. Ephemeral will open on March 12 and will continue to April 12. The opening reception will take place at the gallery on Thursday, March 20, from 6 p.m. to 8 p.m. Ephemeral’s co-curators have selected works that evoke the Japanese aesthetic of temporality. The exhibition’s early-spring timing coincides with the season of cherry blossom viewing—traditionally an occasion for reflecting on the mutability of life while watching the falling of the pale pink petals. Ephemeral explores the implications of impermanence for life and for art. 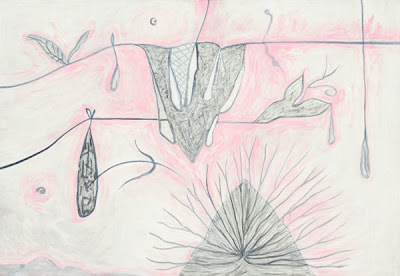 Ephemeral comprises works by Megumi Nagai, Natsu, Akira Ikezoe, Tomoe Murakami, Tetsuomi Sukeda, Ari Tabei, and Aruha Yamaoka. Megumi Nagai’s meticulously painted figures on wood summon the viewer into a dream world of fantastic creatures and happenings. Natsu concocts stunning works in beads. Akira Ikezoe offers oil paintings of flowers, insects, butterflies, and dragons that are suggestive of kimono patterns. Tomoe Murakami captures starry nightcapes in delicately rendered photographs that are studies in subtle chromatic variation. Performance artist Ari Tabei appears in a long dress that she created like a silkworm in a cocoon by rolling and tying together numerous white wrapping papers. Tetsuomi Sukeda’s photographs of Japanese suburbia feature tantalizing glimpses of a teenage girl. Aruha Yamaoka presents photographic close-ups of portions of her face, hands, and hair in dusky tones. Gallery hours are Tuesday through Saturday, 11:00 a.m.–6:00 p.m. Bust out the swimwear, it's time for another shot of Love tonight. The pool is warmed up, resident DJs Sabo and Aaron James are ready to shake you and the Zuvuya Collective is set to stimulates your eyes with live video mixing. Free vodka and wellness screening help keep your juices flowing. Lyons Wier • Ortt Gallery is pleased to announce our third James Rieck solo exhibition titled Annual Report. For the last five years, James Rieck's compositions have been inspired by and gleaned from commercial catalogs. Having delved through couture catalogs of the 1960's, "How To Knit" catalogs of the 70's, wedding catalogs and sexually heightened imagery from the Abercrombie and Fitch genre, James has now set his sights on the grandest of all sales catalogs - Annual Reports. 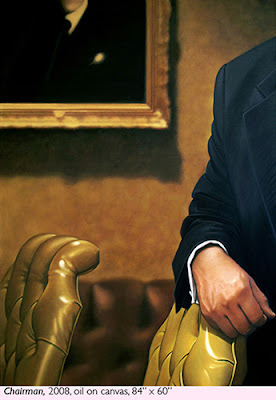 This exhibition features several large-scale oil paintings that address the attitudes and pomposity of multi-national corporations by zeroing in on the body language projected by the CEO, CFO, et al., that are typically featured in these ultimate sales tools. Through amplified scale and deliberate cropping, James Rieck re-contextualizes the familiar compositions inherent to the lexicon of commercial photography. By focusing on the archetypal nature of the subjects, James has delivered a body of work that draws attention to the staging and psychological aspects behind the posturing of the source material. 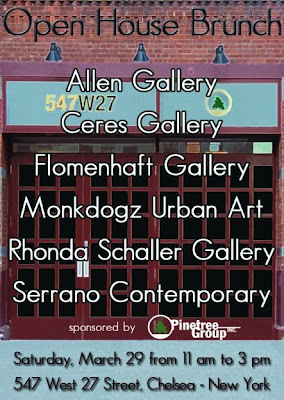 James Rieck is currently a faculty member at the Corcoran College of Art + Design in Washington, DC. He earned both his MFA and his BFA from the Maryland Institute College of Art, attended the Skowhegan School of Painting and Sculpture, and the Glasgow School of Art. In 2006, James received the prestigious Trawick Prize. A catalog for the exhibition will be available in the gallery. 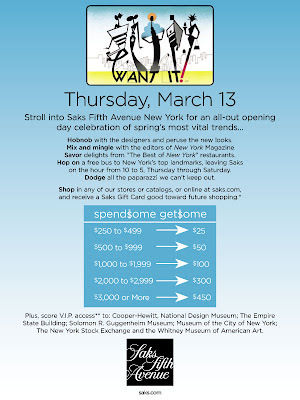 Don't miss this amazing all day opening - spring celebration at Saks Fifth Avenue store. On Thursday 3.13. Click on the picture for more details. 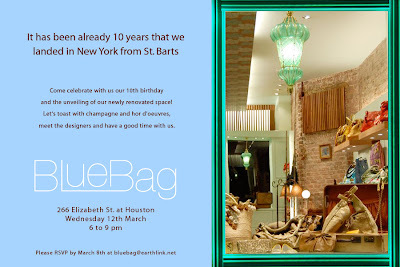 Don't miss this amazing party tomorrow 3.12 starting at 6pm. Click on the picture to read clearly! 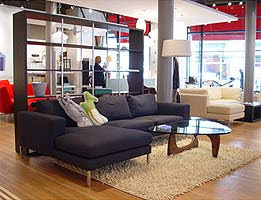 The popular vintage sale at Tribeca hotel is back today March 8th from 2pm to 6pm. ALL winter jackets and coats on SUPER SALE! -plus sweaters on sale! $15-30! NY Studio Gallery is pleased to present an exhibition of recent work by Mexican artist Carlos Rodal. Mr. Rodal’s work establishes a connection between the Mesoamerican civilization and Western contemporary art, reflecting a personal language, which follows in the tradition of 20th century Mexican painters such as Rufino Tamayo and Juan Soriano. The artist is located in a postmodern global/local culture, incorporating the expressions of both native and distant cultures, past and present, with a deep connection to the roots of these millenarian societies. The artist’s personal visions originate from the Southwest’s tropical and desert regions, which influence his references to the plant and animal kingdoms. They are worlds of opposite nature that when encountered are intertwined and complemented, located in spatial atmospheres where the compositions and figures float in space amidst a light fog. The chromatic scheme is characterized by a range of intense and brilliant shades that are reminiscent of color used not only in the cultures of contemporary Mexican pueblos but also in pieces of ceramic, frescoes and codices found in Mesoamerican archeology. Poetic and magical aspects of the work act as a transforming energy for human beings. They convey the fundamental premises of the artist’s aesthetic creed: liberty and honesty both in life and in the process of elaborating the art works. It Can Start Whenever You Want. It Can Start Whenever You Want deals with the transition and potentiality of materials. The artists in the show use varied modes of representation and action. They generate performativity and flux through their specific use of materials that can be both unsubstantial yet solid, in motion but still, analogue and digital. The different states of aggregation pervade each other creating an open system held up by its constant instability. When: Monday, March 3rd 2008 at 7:00pm. $75.00 per person includes tax & gratuity, prepared by Executive Chef, Greg Zapantis. Generously sponsored by Konstantinos Drougos & Wonderful Ethnic Wines. To RSVP, please call: Kellari’s Parea Greek Bistro at 212-777-8448 and mention the wine tasting event.